Summer is here in full-force and I’ve moved most of my “oven-required” dinners to the slow cooker, the grill, or off the menu till Fall. It’s warm enough without my cranking up the oven to fix dinner. That’s just fine for most entrées but it does present a problem for fish. Sure, I could sauté the fillets and create a quick sauce in the pan, but every time I serve it? For me, poor grill master that I am, grilling a fish steak means 5 minutes of fighting to get the poor thing unstuck from the grilling surface, no matter what that surface happens to be. And that’s where today’s recipe comes into play. Cooking en papillote is a method of cooking something, frequently seafood, while enclosed in a pouch of parchment paper. 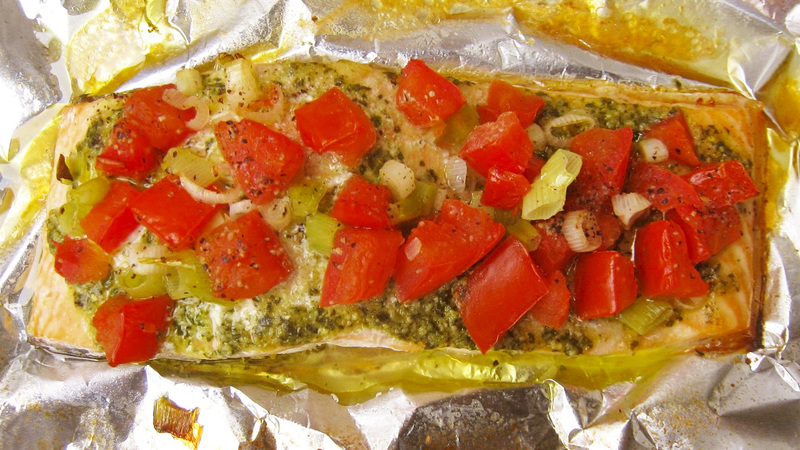 Usually baked in an oven, I use aluminum foil and cook the fish on my grill. No muss, no fuss, and dinner is served. As for the recipe, there really isn’t one and this is more a set of guidelines. As such, I’ll list elements of the 3 components, describe how to wrap the fish, and it is for you to decide which ingredients will work best for you. Although, if left to me, I’d vote for a salmon steak thinly coated with pesto and topped with diced tomato and scallion. Yum! One 6 – 8 oz salmon fillet or steak, per person. Bass or trout are good alternatives. Chopped fresh herbs. Tarragon, basil, thyme, dill, oregano, parsley, and/or cilantro are suggested. Pesto may be used, as well. Optional fresh vegetables, evenly chopped in a large or small dice or thinly sliced. Choices would include asparagus, onion, tomato, carrot, zucchini, fennel, spinach, summer squash, bell pepper, scallion, etc. Optional splash of white wine per serving. Combine chopped herbs and garlic with about 1 tbsp of butter per piece of fish to create a compound butter. This may be done well in advance. Pre-heat grill to a medium heat, about 350*. Prepare it for “indirect” grilling. Finely chop or thinly slice the vegetables, if any, dress with a little extra virgin olive oil, and season with salt and pepper. If using a bed of vegetables: in the center of the bottom rectangle, form a vegetable layer, add the fish (skin-side down), season with salt and pepper, dot with the compound butter or pesto, top with lemon slice(s) & zest, and sprinkle with chopped parsley. If not using a vegetable bed: place the fish in the center of the rectangle (skin-side down), season with salt & pepper, dot with compound butter or pesto. At this point you can either: a) top with lemon slices & zest, garnish with chopped parsley, and add a splash of white wine: or, b) place the vegetables atop the fish, add lemon slice(s) & zest, and garnish with chopped parsley. Fold the other half of the foil so that it fully covers the bottom rectangle containing the ingredients. Beginning on one side, start crimping and sealing the edges of the foil’s top and bottom. You will need to do this to 3 sides of the pouch. (The 4th side is the fold and, as such, is already sealed.) Be sure the pouch is well-sealed for you don’t want any steam to escape during cooking. Use the indirect grilling method to determine the placement of each foil pouch. Fish should be cooked in 15 – 20 minutes, though times will vary depending upon the size and temperature of the grill, the types and cut of the vegetables, and the thickness and kind of fish used. I’ve already listed pretty much all the variations I can think of, save one. 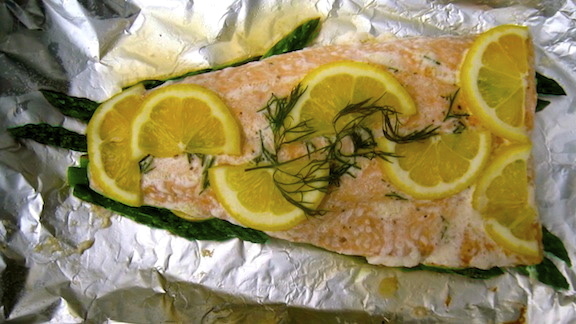 Not everyone has a grill but all that means is that you have to “move the party indoors.” That is to say, prepare the fish as indicated above, using foil or parchment paper to create the pouch. Place the pouch on a baking sheet and bake for 15 – 20 minutes in the center of a pre-heated, 400* oven. Again, cooking times may vary. This entry was posted in Seafood (Frutti di Mare), Vegetarian and tagged Food, Grilling, Recipes, Seafood by ChgoJohn. Bookmark the permalink. First off this is simply stunning and it puts my turnip, potato bake to shame… well OK, maybe those would be a nice side. I haven’t grilled fish yet this year and now have a serious hankering for it. Nothing puts your turnip, potato bake to shame! I’ll be leaving tomorrow to visit Zia and I’ve promised her a salmon dinner with root veggies, all cooked atop her grill. Thanks to your contribution, it will be one heckuva dinner! These are as pretty to look at as to eat!! I grilled salmon this past weekend using a grill basket as like you mentioned, it would be stuck or falling off all over! Encasing it in the foil definitely must keep the fish moist. I am going to try out your method….along with Greg’s veggies! 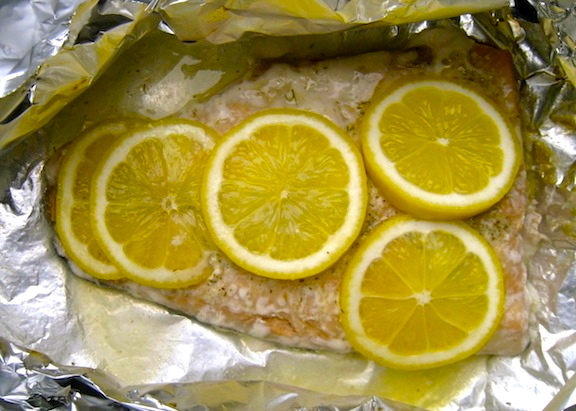 I converted to “en papillote” 2 Summers ago, after my latest grill pan grilled as if coated with fish velcro. I’ve not had a bad piece of fish since and the “unveiling” at the table is sure to bring oohs & ahs. As for Greg’s vegetables, I’m sure he’s caused a mini-shortage of root veggies as more and more people saw that posting and rushed to get the ingredients.